Bartering might seem like something that happened only in ancient times, but the practice is still common today. And the general definition remains the same: the exchange of goods and services without the exchange of money. Because no cash changes hands in a typical barter transaction, it’s easy to forget about taxes. But, as one might expect, you can’t cut Uncle Sam out of the deal. The IRS generally treats a barter exchange similarly to a transaction involving cash, so you must report as income the fair market value of the products or services you receive. If there are business expenses associated with the transaction, those can be deducted. Any income arising from a bartering arrangement is generally taxable in the year you receive the bartered product or service. And income tax liability isn’t the only thing you’ll need to consider. Barter activities may also trigger self-employment taxes, employment taxes or an excise tax. Let’s look at an example. Mike, a painting contractor, requires legal representation for a lawsuit. He engages Maria as legal counsel to represent him during the litigation. Maria charges Mike $6,000 for her work on the case. Being short of cash, Mike agrees to paint Maria’s office in exchange for her $6,000 fee. Both Mike and Maria must report $6,000 of taxable gross income during the year the exchange takes place. Because Mike and Maria each operate a viable business, they’re entitled to deduct any business expenses resulting from the barter transaction. You may wish to arrange a bartering deal though an exchange company. For a fee, one of these companies can allow you to network with other businesses looking to trade goods and services. For tax purposes, a barter exchange company typically must issue a Form 1099-B, “Proceeds From Broker and Barter Exchange Transactions,” annually to its clients or members. 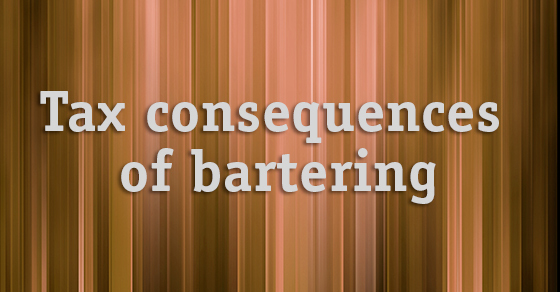 Although bartering may appear cut and dried, the tax implications can complicate the deal. We can help you assess a bartering arrangement and manage the tax impact.